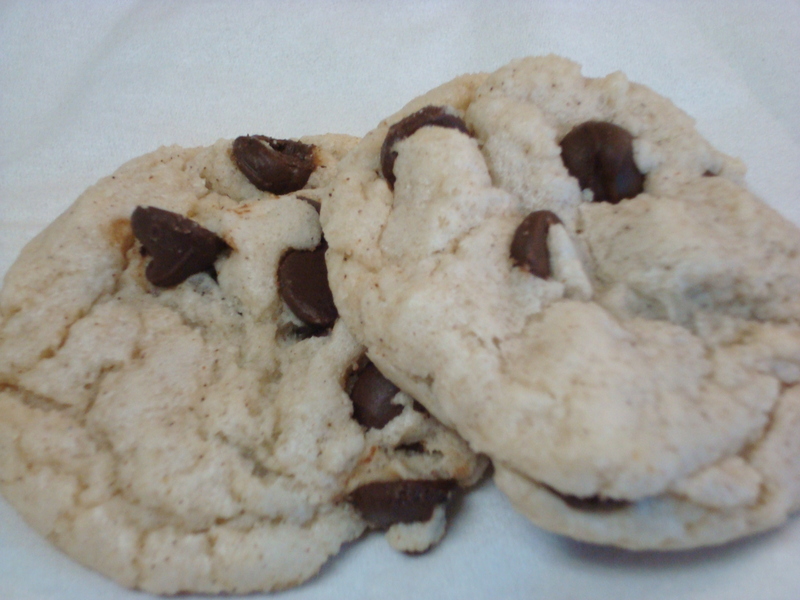 Friday Feast: More Chocolate Chip Cookies! I let a very kind coworker and friend borrow our air mattress over the Labor Day holiday, and she brought me back a whole Tupperware full of very amazing and yummy cookies to thank me. Of course this was not necessary, but ooh boy do I appreciate them. (Cookies are my #3 favorite food after margaritas and doughnuts. Grapes are somewhere in there too.) They were so good that I asked her to send me the recipe. These sweets are apparently vegan, but she uses regular chocolate chips and regular flour. She also doesn’t stick to the “room temperature” bit, but as usual, I’ll keep the original in here and you can stray off the recipe as you like. I highly recommend this cookie. Very yum version of the original. VERY IMPORTANT-make sure all ingredients are at room temperature. It will work if they’re not at room temp, but it works MUCH better if they are. Also while your oven is pre-heating put the cookie sheets you are going to use on top of the oven so they get preheated as well. Preheat oven to 350. In a large bowl mix flour, baking powder, salt, cinnamon (if you choose). Add chips. Make a well in the center and set aside. In a medium size bowl mix sugar and oil. Mix it well. Add the vanilla and then add the water. Mix it well. Add the wet to the well in the dry. Mix it well but be careful not to overwork it. Add more chips if you need to. Spoon onto ungreased cookie sheets. Bake for 5 minutes and then flip and rotate the sheets. (top to bottom, and 180 degree rotation) Bake another 4 minutes and check them. “Margaritas” are not a food. But that made me laugh.